The client was looking for a way to create a more efficient method to distribute single serve products in convenience stores. The objective was to find a solution that would allow the salesperson to assemble a pre-packed display in as little time as possible. 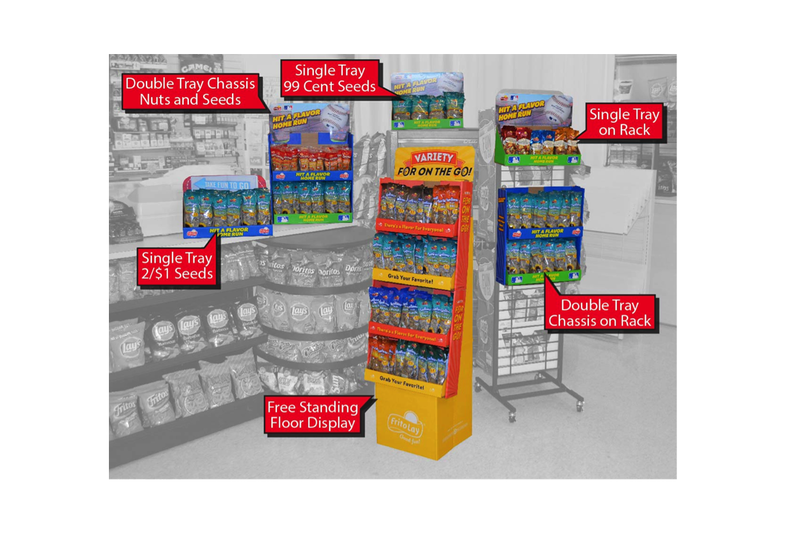 A freestanding display would allow greater distribution of products traditionally found on the front of a gondola. The target market was convenience food shoppers, young to middle age males of median income. The project was focused on improving the efficiency of the internal logistics and sales force operations. The customer had a variety of product lines including nuts, seeds, premium nuts and mixed nuts. Each was merchandised in its own individual product specific display (floor-stands and counter tops). These displays had limited if any flexibility in what could be merchandised in them and how it could be used in stores. There were no common parts or pieces among the displays. An existing convenience food tray successfully being used in other formats was already in inventory. A redesign of the previously employed tray was necessary in order to make it flexible enough to accommodate four product lines and many SKU’s, all of different sizes such as 2/$1 product as well as $.99. Collapsible partitions were added in order for it to be a solid solution for an array of similar products. We created additional efficiencies centered on this tray to maximize its versatility throughout the store. The new tray can act alone as a countertop, cooler topper or hanging unit. The tray can easily be mounted into its accompanying Double Tray Chassis (DTC) where two tethered trays can act as a counter top or a sidekick/powerwing hung from wire racks. Two DTC’s together can be added to an easy to assemble base to turn into a freestanding floor-stand display. Triple & Quadruple Chassis can be employed using the same process to expand capacity. The trays/shelves can also be detached and used as stair step caddies on the gondola or any other flat location throughout the store. The most interesting engineering principle developed is the cantilevered locking system that keeps the trays in the DTC. This system also makes it simple to disengage the tray so that it may be used individually or replaced with full trays. Improved distribution opportunities – on counters, on coolers, floor-stand, on FEM’s, in gondola, hanging all over the store.